Monitoring with data loggers enables temperature levels in the ponds to be analysed. This environmental research records heat changes which affect oxygen levels, which in turn affect the behaviour of invertebrates living in the ponds. Freelance amateur freshwater biologist Alan Rowland monitors ponds for interested parties. 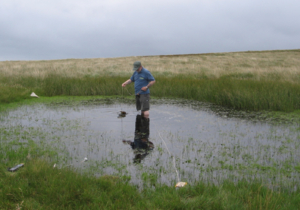 His research has included the monitoring of a series of ponds on Lundy Island, with the results published in the Lundy Field Society Journal of which Alan is Vice-Chairman. Alan uses Tinytag temperature data loggers to monitor heat levels in the ponds. Freshwater invertebrates, like all animals, are dependent on oxygen levels in the water to breathe. As the temperature rises, oxygen is depleted and is of course used up by the pond dwellers themselves. Wave action or other water movement aerates the water, but in still ponds they tend to lose much oxygen overnight. Freshwater invertebrates migrate up and down the water column in relation to oxygen levels and heat. Some have a wider tolerance of heat than others which creates niche habitats. Three temperature loggers are used, one placed on the bottom of the pool, a second placed fully submerged just below the surface, and the third placed on dry land by the pond edge. The units are placed at least half an hour prior to the programmed start time for the 24-hour run so that the sensors have time to match the ambient temperature. The resulting data is then collected and analysed using the Tinytag Explorer Software. Detailed results can be seen in the pdf file which presents typical recorded data as a graph in the Tinytag Explorer software. Alan has found the Tinytags to be reliable, robust and easy to use. He comments, "I find them to be ideal for the purpose and the graphs produced in the Tinytag Explorer software are an ideal format for the publication of papers. For use in the field, they cannot be beaten!"